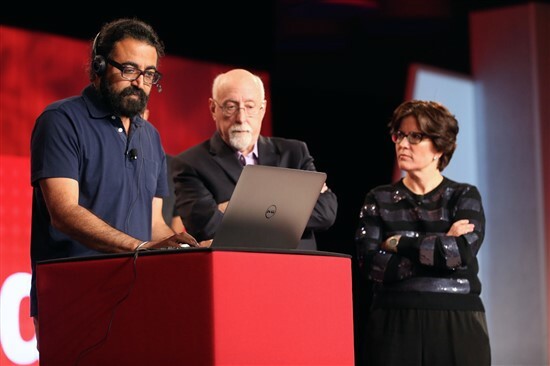 At the inaugural Code Conference in Rancho Palos Verdes, Caliornia today, Microsoft’s new CEO Satya Nadella sat down to talk with Re/code’s Kara Swisher and Walt Mossberg, where he demonstrated a real-time language translation tool that has been built into Skype. Dubbed as the ‘Skype Translator’, it allows users to have a conversation with someone who speaks a different language in real time. During the demo, Skype’s corporate vice president Gurdeep Singh Pall, speaking in English, had a conversation with German-speaking Microsoft employee Diana Heinrichs over Skype. Their chat was translated in real-time through speech and text. “It is early days for this technology, but the Star Trek vision for a Universal Translator isn’t a galaxy away, and its potential is every bit as exciting as those Star Trek examples,” Pall wrote on Microsoft’s official blog. “Skype Translator opens up so many possibilities to make meaningful connections in ways you never could before in education, diplomacy, multilingual families and in business. Imagine in the very near future technology allowing humans to bridge geographic and language boundaries to connect mind to mind and heart to heart in ways never before possible.